(A virtual patient that is.) Managing pain in post-operative patients is a key skill for nurses. Failure to control and reduce pain during recovery from surgery can have dire, sometimes fatal, consequences; DVT and pneumonia are just two of the potential resultant complications. However, due to the obvious inherent dangers, student nurses cannot take full responsibility for the recovery of patients on a ward. This leaves a gap in experience between pain management theory taught in the classroom and ward placements under close supervision of qualified nurses. Virtual Pain Manager (VPM) is an online high fidelity simulation which bridges the gap between theory and practice. 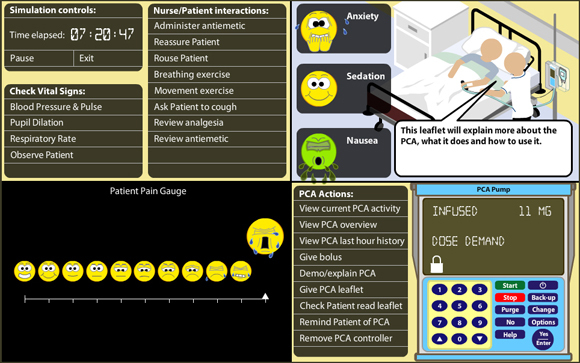 It simulates the use of a Patient Controlled Analgesia (PCA) machine with a post-operative patient. Students are first taught pain management theory in the classroom, then they are given access to the simulation. 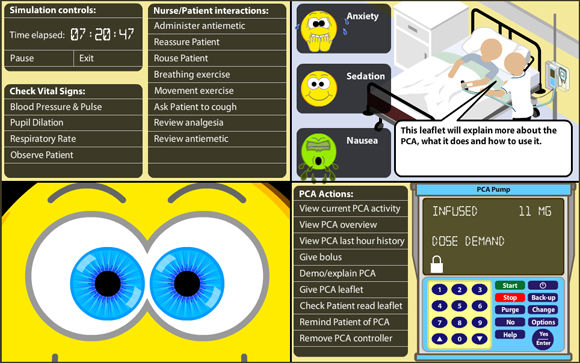 The student nurse must control and reduce the patient’s pain sufficiently, ideally within 48 game hours so that the PCA may be withdrawn, and substituted with oral analgesia. If after 72 game hours the patient’s pain remains high, or is not under control, then the student nurse is judged to have failed. If the care is negligent, this can lead to complications, and possibly death. In the real world such an outcome is, shall we say, ‘highly undesirable’. Yet there is often more learning in failure than success. In the virtual world student nurses can replay the simulation again and again, each time adopting different strategies and observing the outcome, good or bad, of each. But always with the knowledge that even if the patient dies nobody has actually been hurt. What happens to a patient’s respiration rate when you inject 5mg of Morphine? That’s just one of the dozens and dozens of questions that I asked Gareth Parsons, the academic I developed VPM with. Incidentally, that was one of the easier to answer questions I asked Gareth, other questions tested Gareth’s knowledge to the full. Creating a complex interactive simulation, such as VPM, requires a close working relationship between the academic and designer/developer. The knowledge of each specialist must be harnessed to create an engaging experience that also fulfills the learning objectives. Building VPM required me to understand how parts of the body, such as the heart, lungs, stomach, brain and eyes interact in the presence of morphine and/or pain. I also had to understand complex processes such as pharmacokinetics to be able to reproduce them in the virtual patient. Underlying the user interface is a complex model of the human body that controls and reacts to various stimuli: chemical, physiological and psychological. 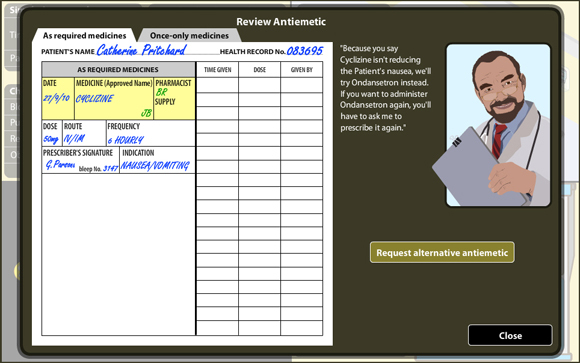 Built using OOP methodology in Flash Actionscript 3, the interactions between morphine and respiratory rate, sedation, pain relief, nausea, blood pressure, pulse, the aggression of the patient’s pathology and more are played out as in a real human. 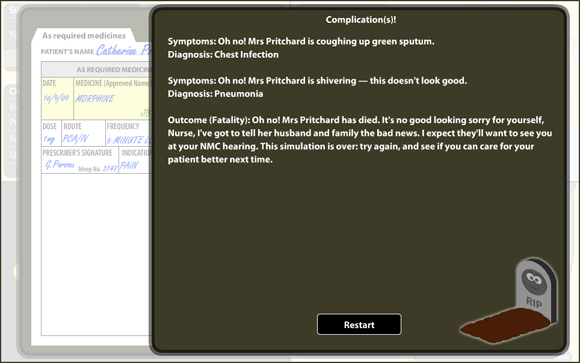 The data for the simulation is held in an external XML file, allowing the academic to create multiple patient scenarios easily. As such the simulation difficulty can be adjusted to provide more challenging situations for the learner. Each scenario is also randomly effected by the simulation engine, encouraging real learning and application of knowledge, as opposed to learning to beat the scenario through repeat play. In 2009 VPM received a commendation in the Jorum Learning & Teaching Competition at the Association for Learning Technology conference. You can view my VPM conference presentation on Jorum. Following this VPM was made available as an Open Education Resource for other educators to use. 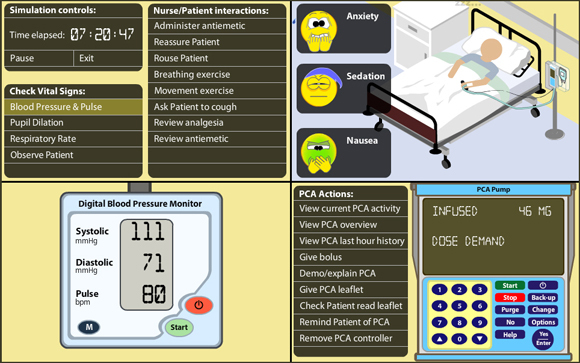 In 2013 German and Welsh language versions of Virtual Pain Manager were released.